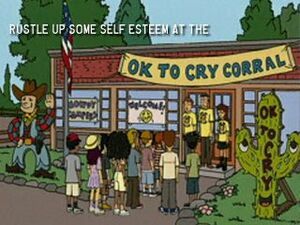 The Okay To Cry Corral is a children's summer camp, intended for highly sensitive children, run by Timothy O'Neill in Is It Fall Yet?, in one year having the assistance of Anthony DeMartino and Daria Morgendorffer. It is held in one of the Lawndale County school district's elementary schools. Link is one of the children attending the camp. O'Neill tries to use arts, crafts, thinking exercises, and other techniques to help improve the children's esteem and help them better understand themselves. The kids, however, usually want to go play outside, something O'Neill forbids for fear of injury. DeMartino managed to have a significant impact on the campers, teaching them by example to stand up for themselves and not take crap. O'Neill was a bit embarrassed to learn this had done more good than his efforts had. This page was last edited on 26 April 2018, at 20:26.